​The image of the shepherd with a flock of sheep refers directly to Christ the Good Shepherd. The priest becomes the shepherd of the people of God through his priestly ordination, because he acts like another Christ. He’s the instrument through whom God has wanted to act in the life of Man. This is something really important, sometimes difficult for some understand, but it’s a great gift from God to the men in his Church. 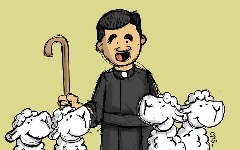 The priest looks for the lost sheep and brings them back to the flock. He loves them, brings them back, embraces them with tenderness when he finds them. A shepherd must be authentic, that is, he must let the sheep graze in calm. He watches over them, but also gives them space. The sheep know their shepherd’s voice, they don’t go just with anyone. Some years ago Pope Francis said that priests must have “the smell of the sheep,” they must get involved in their lives, be with them, and carry them when necessary. It’s not an easy mission but, trusting God’s grace, we know that it can be done with love and joy. “I myself will gather the remnant of my flock from all the lands to which I have banished them and bring them back to their folds; there they shall be fruitful and multiply. I will raise up shepherds for them who will shepherd them so that they need no longer fear or be terrified; none shall be missing” (Jer. 23:3-4).